Heather's writing is featured on the Creative Maven blog, Medium.com and on Amazon.com. She is extremely active on social media and has also been an executive ghostwriter for many years. Currently you can find her list of favorite books on Good Reads. Improve It! 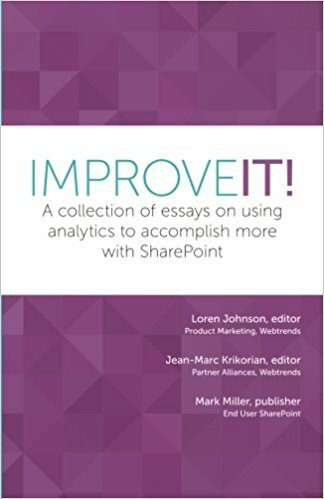 is a collection of essays from SharePoint community thought leaders about how to get the most out of SharePoint. It shares the latest thoughts on SharePoint’s continual evolution and how organizations can improve the value and impact of their intranet. With multiple perspectives from Microsoft insiders, leading SharePoint consulting firms, and industry luminaries, find out how using analytics to measure SharePoint for social, collaborative, and engagement enables improved ROI. Heather and her Content Panda business partner, Simeon Cathey wrote chapter 5 of ImproveIT, The Road to Awesome SharePoint Adoption. It is available on Amazon.com for purchase or for free download from publisher Webtrends. Location: Maui, Hawaii. June 2015. Airport Beach, Ka’anapali, Heart in the sand, eyes to the ocean.